In the beginning of the year my husband and I came to a crossroads. Tension had been building and neither of us could really put our finger on the source. Thankfully, we have awesome friends that we are doing life with and we called them in to help. A three-hour counseling session happened and tons of healing and breaking of strongholds took place. After the session, I decided to sacrifice some things that are very important to me in order to create space in our weeks and months to come for God to grow us. Well, those weeks and months have been ticking by, but I have not seen what I expected to see. Don’t we all do this? We lay our sacrifice at Jesus’ feet with inner expectations of what the return will be. I figured if I put my prized (worldly) possessions at the feet of the Father I would get exactly what I wanted. Now I didn’t do this consciously, the idea formed in the corner of my mind without me realizing it. Over the course of the last few months that expectation grew and so did my disappointment. About three weeks ago I found myself feeling irritated towards my husband. It was in that P-M-S kind of way and I thought would subside in a few days. It lingered still and then three weeks in, I realized it had not only stuck around, but had grown in intensity. This is where God stirred up the perfect atmosphere for him and me to have a heart to heart―in the salon chair of all places! I was under the hood and feeling all cozy reading a book (a book I should have already finished, but God’s timing is no joke y’all). In the last chapter of this book, I heard the Holy Spirit whisper to me the reality and root cause of my frustration towards my husband. It wasn’t in the little list of offenses he had committed over the course of the last month. It was due to an unfair expectation I allowed to take root back in January. I was instantly broken and truly fighting tears as I had an inner dialogue with the Creator of the Universe. Um…okay, I get that. But he has not been holding up his end of the bargain. He has been letting me down too! I may have been short with him, but he deserved it! What does that have to do with you? Apologize for your portion. How do I do that without bringing up HIS portion? He has stuff to be sorry for too! He didn’t work on any of the things we talked about! Ashley, Sweetie, we are still working on stuff that has been in your life for more than 20 years, did you really expect him to radically change in three months? His growth is in my timing―not yours, Love. Okay, I can apologize, but I am not sure what it looks like to do that without explaining why I got irritated with him in the first place. This is not like me. How do I keep quiet about my disappointment? With this last sentence I can almost hear the smile. We are entering new territory―together. Later that night, I shared with my small group what I knew I needed to do when I got home. I shared the story and told them I would need their prayers for me to keep my mouth shut. I was desperately going to attempt to be a new person and just look my husband in the eye and apologize for building a case file against him over the past few months. And that is it. No explanation and no expectation of a return apology. I told them it would be an act of God if these were the only words spoken, but I happen to believe in miracles. On my drive home I prayed (out loud) and declared the truth over my marriage and my husband. I also asked Holy Spirit to go before me and prepare my husband’s heart to hear the sincere words of my mouth and only those. I did spiritual battle against the spirit of condemnation and I released my husband from feeling the need to apologize too. I released him from the expectations I had placed on him over the last three months. I thanked God He has my husband in the palm of his hand and that his divine timing for my husband’s growth is bathed in love and grace―just like my own. I sat on the bed that night and gave the most divinely inspired apology I have ever delivered. It was purely the work of the Holy Spirit and I will make no arguments to the contrary. My heart was exposed and I owned my portion. When I was finished the atmosphere shifted in the room. I felt it get lighter in myheart. I had no idea how heavy the burden of unmet expectations had become on my soul. I had the best sleep I ever had in weeks and I woke up in a state of such bliss! I risked a lot on God’s urging to only focus on my portion. It paid off beyond my wildest imagination. I am seeing my husband in a new light. The lies of the Enemy that were entangling my love for him have been banished. I am seeing that expectations become the fertile ground for the lies of the Enemy to grow. 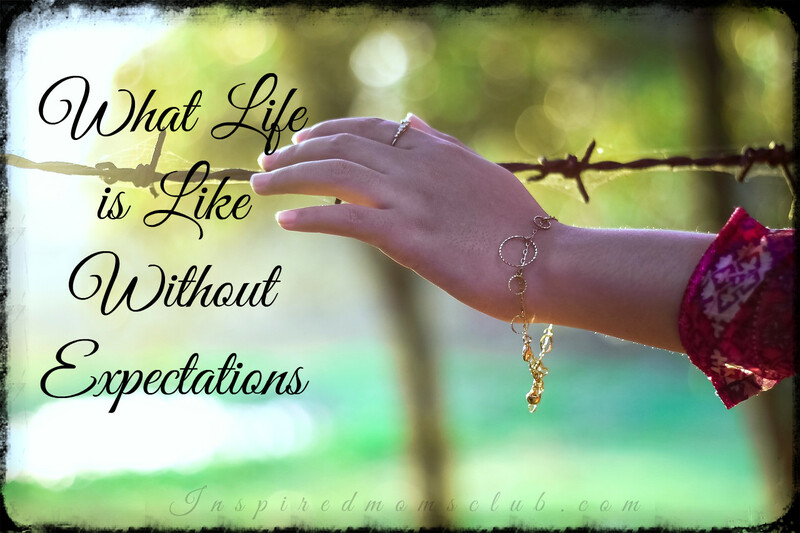 I want to live my life free of expectations. This sounds crazy and somewhat impossible to do but I want to press into the idea I can live a life of freedom and abundant joy because I am owning my portion and releasing others from my expectations. I want to love without strings (of expectations) attached. There is a level of love and respect we can give everyone without expecting anything in return. This is not to say we become a doormat. If one is to be close to you, there must be proper boundaries and yes, certain expectations to maintain a healthy relationship. But at the entry-level, we need to drop the expectations. Love is for all. Agape love is in a way void of feelings. It is the choice to sacrifice our egos and feelings to present a level of love to all regardless of anything. We tend to put agape love as this top-of-the-tier level of love we are to achieve, but I would argue it is the first and most important level of love to strive for. The reason being, when the other types of emotional love are under attack, you need to be able to operate out of agape love towards any and every one. The only way I know how to do that now is to ask Holy Spirit to guide me in my interactions towards that person. I free them from any expectations and simply seek to own my actions and my portion. This is radical and surprisingly the most free I have ever felt! Today I pray you can see the areas of your life that feel disappointing because of unmet expectations. I urge you to see them and cast them into the pit of lies. God’s ways are so much higher than our ways. When we think we can figure out the best way for a scenario to play out it’s putting God in a human box.